You’ve heard a Bitcoin. Everyone’s heard of Bitcoin. Even your Grandma’s heard of Bitcoin! But what on Earth is Bitcoin?! Is it just a buzzword or does it really matter? And, if so, how should you use it in your classroom? First, let’s address the elephant in the room: what is Bitcoin? In the most simplified terms: Bitcoin is a cryptocurrency. So, basically, the definition of a concept most people don’t understand is another word most people don’t understand! Let’s back up and look at the more important piece of the puzzle: cryptocurrency. Cryptocurrency is kind of what it sounds like: a currency that is encrypted in a way that has a very low probability of counterfeit. It’s digital currency, and it is not controlled by any person of group of people, which makes manipulation equally difficult. The logic is that cryptocurrency is safer and more universal than any other currency. If everyone used Bitcoin, for example, then there would be no need to exchange your currency for another country’s currency whenever you went to a different country. Bitcoin is just one type of Cryptocurrency (albeit the most popular), but there are a few others--notably Litecoin and Ethereum. 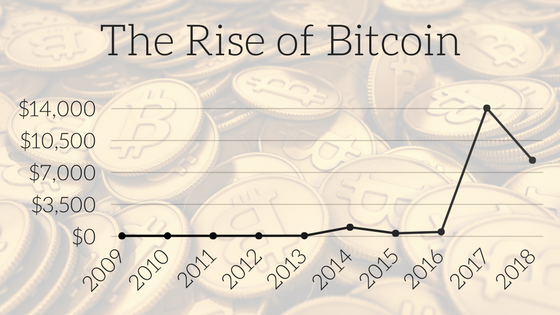 If you’ve heard of Bitcoin recently, then it’s probably because it’s Wall Street’s latest buzzword--largely due to the rapid increase in value. Take a look at the chart below--see that spike? Good news if you own Bitcoin! The price has begun to stabilize since its peak, but this gives you an idea of why there’s so much excitement. Cryptocurrency Education: How Can You Incorporate Bitcoin Into the Classroom? Financial Trading labs are being used at high schools across the country as a way of giving students hands-on experience in the financial marketplace. You can see some examples here. You can also contact us if you are interested in hearing how to get one set-up for your school. Like it or not, Bitcoin is now an active part of every trading floor; even those who aren’t actively trading it are actively watching it. To help you incorporate Bitcoin (and other Cryptocurrencies) into your classroom, our Creative Team has created an easy to use Template that schools can use to show the current value of different currencies on their digital signage. It’s updated automatically, so there’s nothing to do once you’ve added it to your display. The Template is included with any of our paid plans. Take a look at it below and refer to this article if you are not sure how templates work. 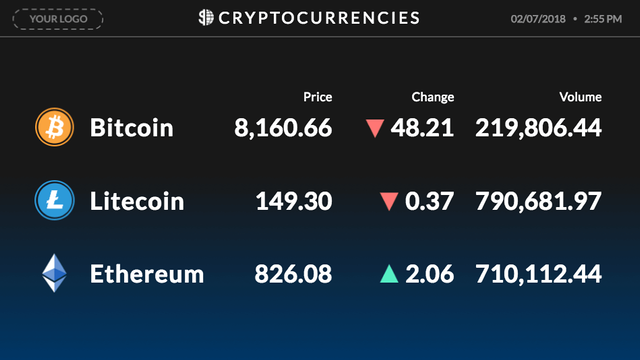 If you’d like to have Bitcoin display on a Ticker, make sure and check out this page. How has technology changed global community? Should Bitcoin be included in an individual's investment portfolio? How can Bitcoin change global economy positively or negatively? The best kind of learning is hands-on learning. Teach students how blockchain work, then use this as the foundation of creating a cryptocurrency for your classroom; let students think of the currencies name, earn it, and use it to trade for real goods.